It certainly has been a busy time for me — the reason for my long absence here. I know I was going to update every few days, but life sometimes gets in the way of our best intentions, and we have no choice but to attend to its needs. 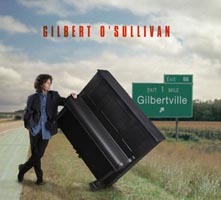 Gilbertville, the latest album from the one and only Gilbert O’Sullivan, was released at the end of last month. It is classic GOS, filled with memorable tunes, clever and personal lyrics. Gilbert’s ageless performance style is always brimming with life and enthusiasm. He never ceases to amaze me with the turns he takes, and how he constantly challenges himself to go in different directions musically (this album was recorded in Nashville, which adds a wonderful quality to the production). The first single off the album, “All They Wanted to Say,” deals with the 9/11 attack in an extremely touching, thoughtful manner. If you can listen to that song and not start to cry, you are made of stone. I am honored to have two of my illustrations in the CD booklet, one of which is being used for tee shirts being sold at his concerts across Europe. How can one not be thrilled to say that? I am so grateful to Gilbert for giving me the opportunity to be a small part of such a fine project. And if you like my artwork, feel free to purchase yourself a copy of the CD from Bygum Records and I will be more than happy to sign it for you (just e-mail me for the contact information). The happy caveat to your purchase will be the wonderful music within — it is sure to fill your life with plenty of joy. I have several projects floating now, none of which I am at liberty to speak of, but all are fantastic. I will be back in a day or so, however, to update all of you on some other developments, plus my usual nuttiness, such as my latest obsession with a local brand of pickles.